Streamline your processes, share knowledge, and bring people together with the most powerful engagement tool. Make it personal with internal videos that engage your teams in new ways. Tap into easy-to-use video galleries to promote knowledge sharing around key business activities. Monitor viewer and engagement data to analyze what’s working and what’s not. Live stream internal videos and go mobile with complete peace-of-mind. Leverage your existing authentication systems to provide secure access with single sign on. Lock your player to a specific network or site with IP address and domain restrictions for complete player protection. Keep your content safe with content protection methods that range from encrypted delivery, to HLSe, and DRM. 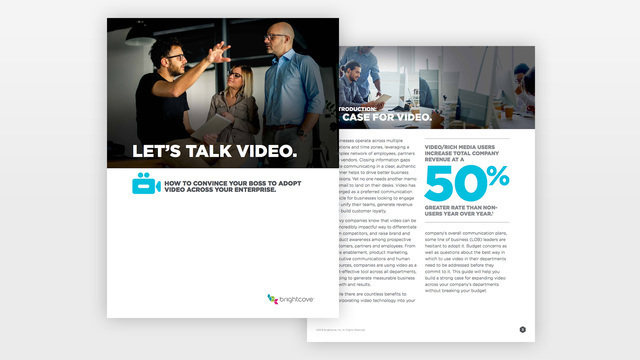 The Brightcove Enterprise Video Suite brings together the video technology you need to create deeper engagement across all parts of your business in one super powerful, super secure platform.